Having your favorite shoes begin to give out on you is devastating at best, but what exacerbates the tragedy, even more, is if this happens shortly before a big event you have been anticipating and working towards all year. Buying a new pair is always an option, but with many hiking and trail shoes, the shoes have to be broken in properly before they are truly put to the test. What other option remains, but to learn how to repair leather hiking boots? A beloved pair of shoes can last much longer if you know to perform leather boot repair. The serious outdoorsmen will often times go through many different hiking boots before managing to find a brand that simply molds to their feet and reads their mind on the trail. Once this resolve has been made, there is very little that can sway the hiker away from the favorite shoes. The one thing, however, that can seriously hamper this happy pairing between foot and shoe, is when the shoes finally start showing their age, at whatever age that might be. Showing age is not necessarily an indication that it is time to throw them out, the shoes may still be salvageable, and with the right information, many of the broken areas can be mended. If you have a hole in the leather of your shoe, or if the sole is peeling away from the leather, the problem is easy to spot. Being able to mend a shoe is very much dependent on what part of the shoe is broken. In some cases, a cobbler may need to assist, and in some cases, it is simply a matter of knowing what to do in order to fix it at home. Making the most out of your shoes not only means knowing how to fix small breaks, but it also means knowing how to care for leather hiking boots. Here are some common weaknesses that occur with leather hiking boots, and their remedies. While leather hiking boots are known for the toughness and durability, even the best shoes will eventually show signs of aging. If your leather hiking boots have started getting holes around the creases where the foot bends, you can revamp them and get a few more good waterproof years from them, if you k ow how to mend them! To mend holes in leather hiking boots, you will need some spare leather, a clear drying leather glue, sandpaper, and shoe polish to match the colour of your boots. You can also help maintain the condition of your boots by adding a coat of beeswax to them afterwards. Spend a fair amount of time ensuring that the boots are perfectly clean. Pay special attention to the areas you will be working on. Ensure that the boots are fully and completely dry. Using the sandpaper, brush over the creases and the areas where you will be putting the new leather. Place the spare piece of leather over the shoe, and measure the size and shape you need it to be in order to cover the crucial bits. In order to make it less noticeable, it is recommended to place the leather from the sole of the instep, across the shoe and to the sole on the other side, ensuring that the holes in between that are covered. Spread the glue onto the leather. Pay close attention to the edges and corners to prevent peeling later on. Ideally, the inside of the shoe should be supported. You can use your hand or a tennis ball, or anything that will push out somewhat. Place pressure from the outside too, this will ensure that no air gaps are able to form between the two layers of leather that are being joined together. If the sole of your shoes has started to part from the uppers, it is often due to being exposed to heat. To ensure that this does not happen, refrain from storing your shoes in the hot car, near an open fire, or left in the sun too long. If your boots are looking rather sole-fully distressed, it is definitely time to learn how to replace the part of the shoe that takes the biggest beating: the soles. Replacing the sole is a difficult task, but if you do it correctly it can really save you money. Replacement soles and replacement heel fasteners can be purchased from shoe repairs shops (cobblers). Remove the old unwanted sole. If the sole was sewn on, try to follow the stitching to find a screw or something that secures it, usually near the heel at the back. Undo the stitching without causing harm to the shoe. Using the acetone, clean the underside of the shoe, removing all the old glue and dirt until the underside is smooth and clean. Ensure that the underside is not damaged or torn. If it is, it too will need to be replaced. Sand both the underside of the shoe that was just cleaned with acetone, as well as the bonding surface of the replacement soles. Ensure that both surfaces are clean and free from any sanding dust. Spread the shoe adhesive over both bonding sides, paying special attention to the outside. The instructions on the adhesive’s packaging must be carefully adhered to. Ensure that the sole and the shoe align well together, and begin depressing them into each other, starting at the toe and working down to the heel. The shoe can now be placed with the sole up, and the new sole can be gently pounded down with the hammer. To ensure a lasting bond, clamps can be used to push the sole onto the shoe during the drying process. The drying process usually takes around 24 hours, depending on the adhesive used. If you have used your hiking boots in rocky terrain, chances are they have kicked a stone or two. After a short while, those kick marks actually begin to wear on the leather, which could lead to tears and weaknesses in water resistance. Fortunately, there is a way of rebuilding the leather before it gets too fragile, and the boot starts to need a total revamp. Before you treat the malady as a light scratch, feel along the inside of the shoe to ensure that there is no rise or bump on the inside where the scratch is. If there is, it is best to either take the shoe to a professional who can mend it, or treat it yourself at home with a revamp. There are a number of products on the market that can be used to toughen up the leather. Some of these products include Shoo Gloo, Liquid Leather and Perfect Leather. While these are great products, there are products you are likely to already have at home that can be used with just as much success. One of these products is super glue. Simply dab the super glue over the scuff marks, ensuring that it thoroughly covers the entire weakness. You can cover it with shoe polish if you wish, but this is generally not needed. Repairing broken stitching on leather shoes can be done, despite leather being such a tough material to try and work with. There are great tools to assist in this process because a simple needle and thread simply won’t do this job. One of these tools is a Speedy Stitcher. The Speedy Stitcher is a hand tool that will allow the user to stitch through leather, with the same precision as a sewing machine. It does, however, require some practice first. It comes with diamond point needles and high tensile waxed thread. Before you begin sewing, take a white pencil and trace a line along the area where the stitching used to be. This is the line you will be following with your own stitching. It is recommended to begin sewing where the old stitching begins to come undone. For good measure, however, start two or three stitches before the old stitching ends, and actually go over the existing stitching. Sew along the white line that you traced. Ensure that you end with a double stitch. There is some concern around leather stitching creating holes and destroying the water barrier that leather shoes would naturally give your feet. If you are using the Speedy Stitcher device, you will be using waxed thread with should fill the holes and assist in blocking out the water. Alternatively, a coat of beeswax over the shoes, once the sewing is complete, will also help to create a waterproof barrier, while providing some maintenance to the outer materials of the shoes. If the stitching on your shoes is unravelling alongside the sole, it is recommended to try an alternative to sewing. There are some great shoe adhesive products made from flexible urethane which will bond the sole to the body of the shoe again, fairly seamlessly, while maintaining the waterproof abilities of the shoe. If you need to join the sole with the shoe, follow these easy steps when you are using a shoe adhesive. Apply some glue to the sole of the shoe, and to the bottom of the shoe too. Bring the two sides together, holding them slightly apart to ensure that they line up well with each other. Bring them together, and apply gentle pressure to ensure that there are no air gaps in the glue. Any glue that has appeared on the sides can be wiped away with a wet rag. Use a heavy object such as a book or a brick to hold the two sides of the shoe together while the glue dries. While these repair methods are easy to do at home and can save you a lot of money, prevention is always better than cure. Therefore it is a great idea to get into the habit of performing routine maintenance on your hiking boots, as this will greatly enhance and extend the length that they will be able to carry you around. Good maintenance should include a regular cleaning routine, in which all dirt is removed with warm, soapy water. Good maintenance also includes extra measures to further waterproof hiking boots. A good quality bee’s wax coat can do wonders for the leather. 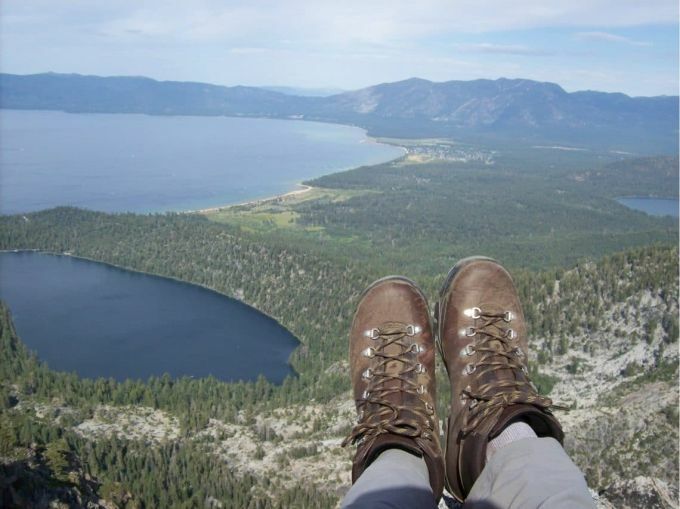 Ensure that your hiking boots are in condition before you go on a hike. A hike places a lot of wear and tear on boots, and if they are already showing signs of a weakness, placing further stress on them without first repairing the weakness will only exacerbate the problem further. Catching a problem early can mean a smaller repair job is necessary, and therefore an overall longer life for the shoes. Treating your shoes to a coat of leather conditioner will also do wonders for their lifespan. Some boots do contain conditioners, but any boot can benefit from a little extra protection from drying out too much. Ultimately, your hiking boots are there to serve you on your journey. They are really the most crucial travel buddy for your feet and also your back. They can promise to carry you to the best scenes you can ever experience from atop mountains, but they can also turn a walk in paradise into a living nightmare if they cause your feet pain and discomfort. You can also check out our review of the best mountaineering boots to give you more options. No matter how many pairs of shoes there are in your cupboard, you will never make memories in any of them, like the memories you make in your hiking boots. For more tips on how to choose the best hiking boots, see our article on this topic. In order to keep your hiking boots in their best condition, and in order to keep yourself on the trails, try our hiking boot repair tips, and tell us how well they worked for you, in the comment section below!